The Finnish naval forces were not involved in naval battles during the Winter War. The Finnish Navy’s existence and winter prevented the enemy from deploying surface vessels in the territorial waters of the Åland Islands and Finland. In contrast, the enemy’s submarines were able to reach the Gulf of Bothnia via the Strait of Märket. The coastal artillery exchanged fire with enemy warships three times. These incidents led to the retreat of the Soviet ships. The coastal artillery’s forts on the sea flank of the ground forces fought against the enemy’s ground forces. Edited map from the work Raunio, Ari, Sotatoimet – Suomen sotien 1939−45 kulku kartoin (Military Operations – The Course of Finnish Wars in 1939–45 with Maps), 3rd edition, Karttakeskus 2013. The navy was in charge of naval defence. The naval forces formed the parts of the navy that operated at sea, while the coastal artillery formed the ground-based combat units. Jaeger Officer, Major General Väinö Valve served as commander of the navy, with Navy Command Finland being his command headquarters. It was part of the General Headquarters. 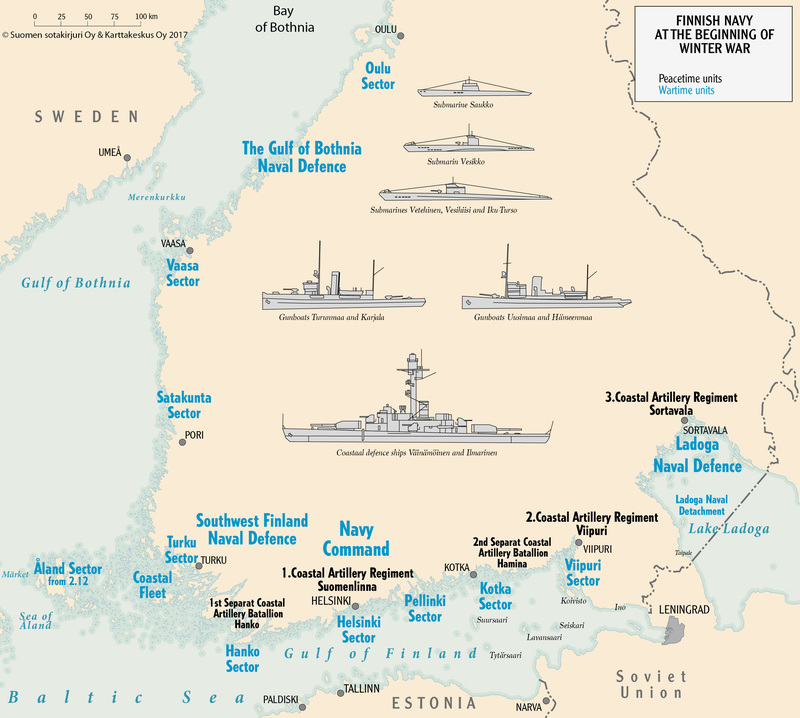 The wartime mission of the naval defence was to protect the maritime routes and repel any landing attempts and other military operations targeting the coast of Finland. The main mission of the naval forces was to protect the maritime routes to the west. The coastal artillery was in charge of defending the coast, and the naval forces also had to prepare to participate in its defence. The navy’s naval operations focused on the Turku Archipelago. From there, it had the shortest distance to the demilitarised zone of Åland, which it could quickly move to protect at the outbreak of war, in addition to securing the maritime routes. 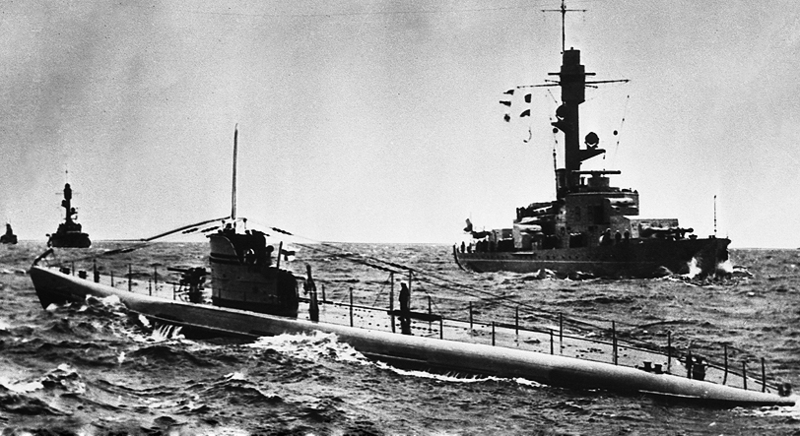 The navy was unable to stop the operations of Soviet submarines in the Gulf of Bothnia. The lighthouse island in the Strait of Märket between the Åland Islands and Sweden was not occupied until 3 December. Sweden and Finland did not lay down their own mines within their own territories in the Strait of Märket until 8 December. The mines did not fully prevent Soviet submarines from passing through the strait to the Gulf of Bothnia and back. The Finnish Navy’s preparedness was raised immediately after Germany invaded Poland on 1 September 1939. The first reservists were called to service. The navy was reinforced to its wartime strength in October during a mobilisation that is known in history as additional refresher training. With the exception of the Åland Coast Guard District, the Coast Guard was incorporated into the navy. The coastal artillery units in charge of fixed defence – three coastal artillery regiments and two separate coastal artillery battalions – were transferred to the coastal sector. The coastal sectors formed in the Gulf of Bothnia lacked fixed coastal artillery. Coast Guard districts formed the bulk of their personnel. The Finnish Navy’s wartime personnel strength was 33 200 personnel at the start of the Winter War. Of this number, 20 700 belonged to coastal artillery and coastal defence forces, 3 850 to naval forces and 8 650 to infantry forces subordinated to the commander of the navy. Minelaying commenced on 25 October. started on 30 November. The Finnish Navy laid 1 600 naval mines in the Gulf of Finland and the northern Sea of Åland. According to estimates, at least one enemy vessel, a submarine, was damaged by mines laid in the Strait of Märket. A naval parade in the Gulf of Finland towards the end of the 1930s. Both coastal defence ships can be seen behind the submarine. Photo: Military Museum. The naval forces of the navy were divided into the Coastal Fleet and local forces of the coastal sectors that were in charge of defending the coast as well as naval forces directly under the commander of the navy. Naval forces had also been subordinated to the Southwest Finland Naval Defence. The bulk of the actual warships belonged to the Coastal Fleet. It was commanded by Captain Eero Rahola. Vessels and motorboats commandeered primarily for the needs of the coastal sectors significantly increased the navy’s fleet. Some of the commandeered vessels were armed and incorporated into the general forces. At the start of the war, the Finnish Navy had a total of 190 ships and 363 motorboats at its disposal. These numbers do not include the vessels at the disposal of the Ladoga Naval Defence. The naval fleet comprised vessels left in Finland by Russia after Finland’s declaration of independence in 1917 and the Civil War of 1918 as well as vessels built in the 1920s and 1930s. The fleet included First World War-era vessels, such as gunboats. There were four gunboats (Uusimaa, Hämeenmaa, Karjala and Turunmaa), two motor torpedo boats (Sisu and Harja) and the minelayer Louhi. Newer warships included two coastal defence ships (Väinämöinen and Ilmarinen), five submarines (Vetehinen, Vesihiisi, Iku-Turso, Vesikko and Saukko), five motor torpedo boats (Isku, Nuoli, Syöksy, Raju and Vinha) and six Ahven-class minesweepers. Sub-sector was subordinated to the Army of the Isthmus. The Coastal Fleet Headquarters and the Southwest Finland Naval Defence Headquarters were located in Turku. The latter was headed by the Turku Naval Station, among other units. The Helsinki Naval Station was under the commander of the navy. The coastal artillery formed the core of the coastal defence. A significant part of the coastal defence of the Gulf of Finland was based on early 20th century coastal forts built by the Russians on the coast of Finland. They were a part of Peter the Great’s naval fortress. Finland supplemented this coastal fortification from the Russian imperial era with new forts in the 1930s. For Lake Ladoga, Finland had to build a completely new coastal defence system with new coastal forts. The compositions of the coastal sectors varied according to the area and assigned duties. In addition to the coastal artillery and coastal troops, the sectors’ forces could include infantry units received from the ground forces. The coastal forces could include infantry-like troops as well as air defence troops. The sectors on the coast of the Gulf of Finland had no fixed coastal artillery at their disposal. The Ladoga Naval Defence, which was a part of the navy, was operatively subordinated to the commander-in-chief. The navy was in charge of matters pertaining to the personnel, training and the maintenance of the defence branch. The commander-in-chief subordinated parts of the Ladoga Naval Defence to the ground forces. In addition to coastal sectors, the Ladoga Naval Defence also included the Ladoga Naval Detachment.